Apologies for tardiness on today’s reflection. I nearly forgot that it was my day. Recently, I was challenged to think of a time when I was courageous. This following seeing a video clip about a WW2 hero who sacrificed his own well-being to save his fellow soldiers. Ummm, I can’t contend with that. I can think about many people who lived much more courageous lives than me. Veterans of wars. Past presidents who were left to make world-changing decisions. Martin Luther King, Jr. King David. The list could go on. What have I possibly done in my life that comes close to matching these people? But maybe I am spending too much time comparing myself to people who were in extraordinary circumstances. As more people shared stories of courage in their lives, I began to think more about the mundane events of life that we face every day that require courage. It might be making a decision in our profession, being a parent, overcoming a fear of public speaking to stand in front of people and give a speech. We ALL face times in our lives when we have to show courage, more than we may ever even realize. Each day I walk the halls of Crone Middle School facing the daily trials of 11-14 year olds; each day I live to teach Creighton what he needs in life; taking on the challenge of running another half marathon; walking onto the baseball field as an umpire; all of these take a certain amount of courage. Too often, I let my nerves and emotions get the best of me. But every day, I keep working to find a different kind of courage. Not courage that I have within myself, that I can gain from my own power. The courage I wish to have more often is the kind that comes from faith in One who has complete authority over all things. In the end, we can have courage because the One who overcame death on a cross has our backs. I still forget this all too often, but I can keep working on my faith. I am making it my goal over the next few days to remember these passages from Joshua, John, and Romans and how I can have courage because of who I have on my side. I encourage each of you to do the same. So when we pray, “in the name of Jesus” what in the world do we mean? Do those words at the end of our prayers now make our prayers valid? Is that the key to the door of the heart of God the Father, that now lends dignity to what would otherwise be considered selfish, or vulgar? Are those words spiritually magic that some how bring about miracle answers? Is there anything more to it than just the repeating of those famous words that even the most cursory Christian seems to know? John 14.14 “And if you ask Me anything in My name, I will do it.” So there we have it, the answer to why we pray like we do, Jesus said it. No strings attached, here is our key to health, wealth, beauty, charm, friends and influence. Obviously there is a logical explanation from the scriptures as to why we do what we do as Christians, believing that our Heavenly Father does care for us and does hear our prayers. Zechariah chapter 14.16 prophetically tells of a day in Israel when all nations that stood against Israel, “will go up from year to year to worship the King, the Lord of Hosts, and to celebrate the Feast of Tabernacles.” This is a Messianic prophecy talking about Jesus, the son of God, the king, God incarnate, who came to tabernacle with Israel, to physically dwell with mankind, in fulfillment of the Feasts of the Lord, which Israel was to celebrate annually as a remembrance of things past, and a rehearsal of things yet to come. Remembering when they were in the wilderness for forty years, and now looking forward to when the Messiah would come to dwell with them. These scriptures and many more tell us how valuable the name of Jesus is, how exalted the name is because of who He is, and what He has accomplished on our behalf. In the Hebrew language, His name is Yeshuwah, meaning ” Gods salvation.” The name of Jesus is authorized to gain the bearer an audience with Yahweh. When I recommend a service or person to contact I say, “tell them Karl sent you,” so they have a point of reference, or commonality. In like manner when we pray in the name of Jesus, it is by His association with us, as having lived with us, and befriended us, being our savior, and High Priest that we now have an audience with God the Father. When doubting Thomas finally met the resurrected Christ, his response was to fall at Jesus feet and say, “my Lord and my God.” He was so amazed, as we should be, that the immortal one would become mortal and then again regain immortality. So to pray in the name of Jesus is to claim association with Him, to recognize His authority as Son of God, high and lifted up, highly exalted, and knowing His position as Judge, and King of the universe, and Savior of mankind. To pray in His name is to honor and worship Him. No one and nothing comes to the Father but through the Son, who is to be praised forever. What to do with enemies? We see Jesus’ response in Matthew 12. The Jonah passage is background for the Matthew passage and I would recommend Will Ward’s blog, yesterday, for understanding Jonah. Jesus encounters enemies, the Pharisees and Teachers of the Law, in this passage. In a sense he had made enemies for he insists on doing God’s will even in the face of opposition, which is precisely what he needs to do and should do to do God’s will. By the time we arrive at Matthew 12:38-45 the Pharisees have already “went out an plotted how they might kill Jesus” (Matthew 12:14). Why would they do such a thing? Jesus and his disciples picked grain on the Sabbath to eat and then Jesus healed a man on the Sabbath. He tells the Pharisees, “Therefore, it is lawful to do good on the Sabbath.” Their response is to plot to kill Jesus. Immediately before our passage in Matthew Jesus heals a demon possessed man who was blind and mute. When the Pharisees hear about this they begin to say that Jesus is possessed and serving the prince of demons. In other words, they call, God’s son, Jesus a servant of Satan and then they demand that Jesus perform a sign for them. Jesus does not mince words and informs the Pharisees that he will not perform signs for them but the only sign they will receive is his death and resurrection (as Jonah was in the belly of the whale). Then Jesus tells them right to their face that they are wicked. Nineveh, a godless country, repented when Jonah spoke to them. The Queen of the South, a non Jew, clearly saw and listened to the wisdom of Solomon. But these self-righteous, judgmental Pharisees can’t see or understand Jesus when he is right in their midst. Instead they condemn Jesus. 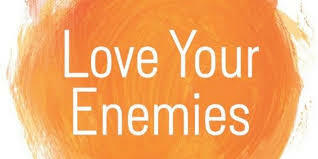 Jesus said, “love your enemies and pray for those who persecute you” (Matthew 5:44). I would expect that Jesus did pray for the Pharisees and teachers of the law. In love he spoke the truth right to them when they were terribly wrong. And it led to the cross upon which he willingly died for all, even the Pharisees. What to do with enemies? Jesus confronted them, spoke to them, prayed for them and loved them even unto death on the cross. 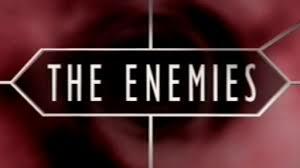 Today, though it is exceedingly hard, let’s pray for our enemies, whomever they may be. The story of Jonah is in many ways a perfect example of how a person can become so comfortable in their own faith that they don’t want to bother encountering those who might be hostile. It is very much the story of many Christians in the United States today. God called Jonah out of his comfortable daily faith and told him to journey to Nineveh and warn the people of their coming destruction. Nineveh was a large city in the kingdom of Assyria and the Bible tells us that is was “exceedingly wicked”. As a Hebrew prophet among Assyrians, Jonah was convinced that they would not listen. He also must have feared that they would see him as unbalanced or out of his mind rather than as a wise man of God. At worst, it is possible that Jonah feared actual physical harm. So in the face of discrimination, loss of status/respect, and fear of his well being, Jonah simply ran away. And in this attempt to keep his own comfort – to run away from those who would laugh at his faith – Jonah created a disaster for those around him. Aboard the getaway ship caught in the middle of a life threatening storm everyone around Jonah worries, “Something is not right here”. Today, as so many people run or hide from serving God in our culture, it becomes more and more clear that “something isn’t right”. As fewer Christians seem willing to live out God’s commands the waters are getting pretty rough and the storm grows pretty threatening. Maybe we all need to take a lesson from Jonah and admit “It’s my fault. I am the cause of the storm”, stop hiding, and face the often uncomfortable job of being faithful in a pretty faithless culture. After all, once he got there, Nineveh’s response was not what Jonah expected. In these 2 chapters, I think you find a great summary of our Bible…God created the heavens and the earth – he created everything good…he created humankind in his image – he created us to care for the earth and all the others he created…in his image. But, as we know, the first humans strayed from the perfect world God created and the perfect relationship humanity first enjoyed with its creator. But, as we know, just at the right time God sent humanity Jesus to show us who God really is and to restore, in part, the relationship humans can have with their creator. Jesus taught a small group at first…12 to be exact and these 12 quickly multiplied and then these disciples (which means learners, students) became his church. And after Jesus showed humanity who God really is, he turned over the keys of his church to these learners/students and said go and make more disciples…make my church grow – I’ll be with you until I come again. Our kids sang in church yesterday. They had a tough and challenging message if we were really listening. It is easy to get caught up in the the stuff around us and stray away from our relationship with Jesus – to think more of ourselves than others. 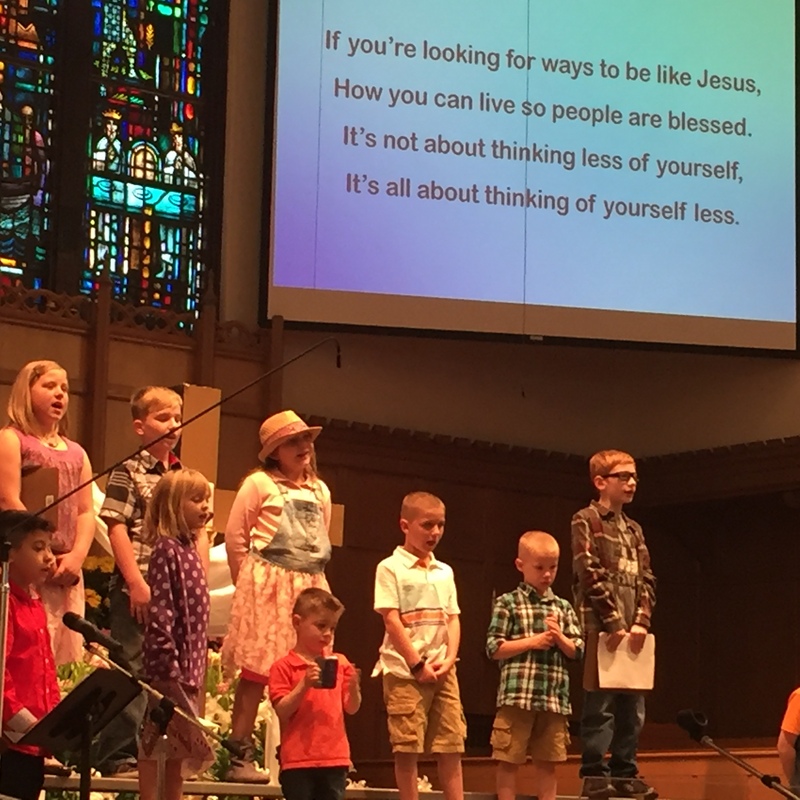 If you look closely at the picture I took while the kids were singing you’ll see some powerful words – living so people are blessed is not about thinking less of ourselves but thinking of ourselves less…ways to be like Jesus. Jesus…the one who showed us who God really is and who tells each of us, in our own way – using the individual gifts God gave us – to go and make more disciples teaching them about Jesus. So, when you are frustrated about all the assorted problems of our world today, ask yourself if you are making a difference. Like our kids, Matthew West has a challenging song for those who claim to be followers of Christ…. Every time I read the Psalms, I am always impressed by the deep connection that I see between the writer and God. It is not just a general knowledge of God, but a deep personal understanding that one has that comes from a daily walk with God. It is part good theology, things one learns from reading the scriptures and going to church, listening to the Word of God being taught and living out day-to-day those teachings. It is something that goes beyond head knowledge or heart knowledge. In a way it is the perfect union of spiritual and earthly living. Faith comes from hearing, and living makes that faith stronger as one lives it out. Somewhere along the way, I feel we lost that value, of seeing the knowing of God intertwined with living out his promise. As we experience this season of Easter, let us bring our hearts and minds closer to our day-to-day, that place where we know and are known by the mercy of the resurrected Lord. Rejoice and be glad. If God is for us, who can stand against us? What do you choose? I choose to place my trust in God. This may be one of my shortest blog entries, but it is because this one is straight forward. Coro [SATB]: Rejoice you hearts, run away you sorrows, the Savior lives and rules in you. You can chase away the mourning, the fear, the anxious trembling, the Savior refreshes His spiritual kingdom. Recitativo [B]: The grave is broken and with it our distress, the mouth proclaims God’s deeds; the Savior lives, so in distress and death all turns out perfectly well for believers. Aria [B]: Let a song of thanks resound to the highest for his pity and everlasting faithfulness. Jesus appears to give us peace, Jesus calls us to live with him, every day his compassions is made new. Recitative Dialog [Hope-T, Fear-A]: Hope – To be joyful in Jesus’ life is a bright ray of sunshine in our breast. Filled with comfort to look upon my Savior and to build within themselves a heavenly kingdom is the possession of true Christians. But since I have here a heavenly refreshment, my spirit seeks here its delight and rest. My Savior calls powerfully to me: “My grave and dying bring you life, my resurrection is my comfort.” Fear – No eye sees the Savior arisen. Hope – Death does not hold Him in its bonds. Fear – Death still holds him in its bonds. Hope – How can fear arise from any breast? Fear – Does the grave give us its death? Hope – If God lies in a grave, then the grave and death do not hold Him. Fear – Ah God, you who conquer death, for you the tombstones yields, the seal breaks. I believe, but help my weakness, you can make me stronger. Conquer me and my doubtful spirit. The God who works wonders, has strengthened my spirit through the might of his comfort so that it perceives the risen Jesus. Duet [Hope-T, Fear-A]: Hope – I do not fear the grave’s darkness Fear – I fear indeed the grave’s darkness. Hope – and hoped that my Savior should not be torn away Fear – and mourned that my Savior should be torn away. Both: Now my heart is full of comfort, and if an enemy is infuriated I shall know how to conquer in God. Choral [SATB]:Alleluia! Alleluia! Alleluia! For this we should all be joyful. Christ will be our comfort. Lord, have mercy.